Dirty boat? Clean it up! 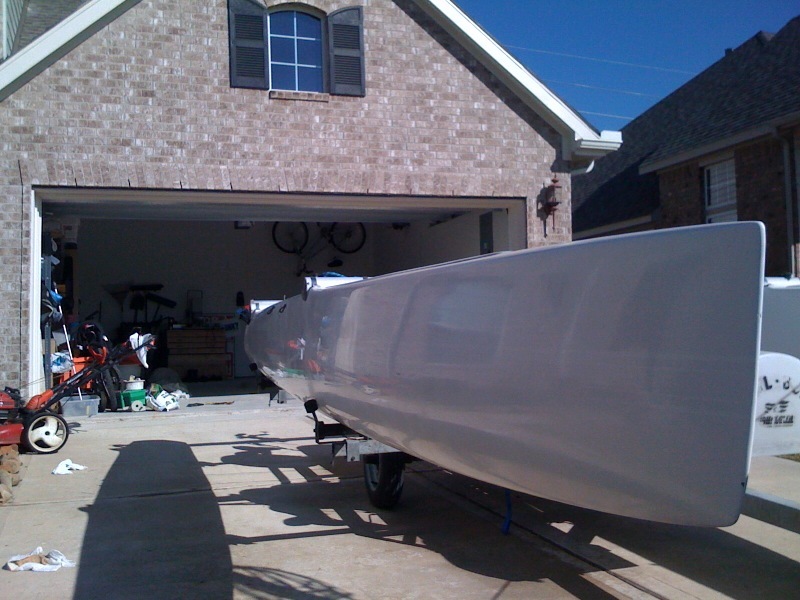 Winter boat project time so one thing that’s always on my list is making my boat shine. This will not make your boat any faster but at least you will look good even if you’re the last boat to the beach! 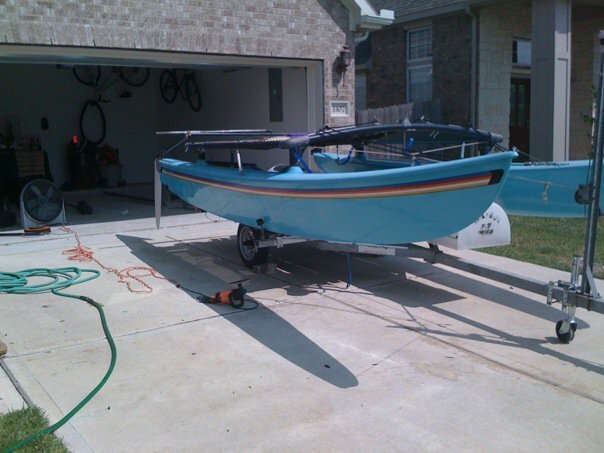 As most of you know I have owned a few boats and not one of them was pretty the day I brought them home. I have spent countless hours in my driveway working on them and the last step is always a nice clean up, so whats my secret to the shine? 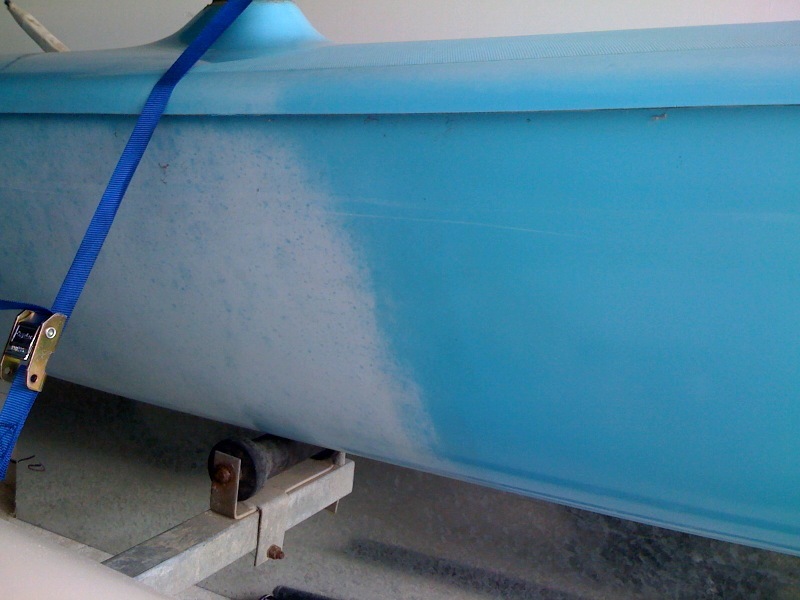 First wash the boat real good with boat soap then scrub with Bar Keepers Friend if your boat has heavy chalky oxidation like the photo above it takes lots of wet sanding! Start with 400 then 600 finally 800 grit by hand use 3M paper on a sanding block it last longer. If you saw the first Karate Kid you already know this but you need to sand in a circular motion. Now you need to buff with a heavy-duty/cut rubbing compound you will start to shine at this point. I finish off with color restorer from Bass Pro it’s the same as Starbright color restorer, I apply it then buff off I do not use this on the inside as the PTEF makes it kinda slick. Its a lot of work but it pays off both the boats in the photos below had sat in the sun for years the H16 is a 1982 the Nacra 5.5sl is a 1989 look at them shine! I use a polisher from harbor freight it’s about $30 you can see it in the H16 photo. The polishing pad I use is a 3M and cost about $20 looks like a sponge with bumps all over it lasted for 3 or 4 boats. I also use 3M heavy-duty cutting compound on both of these boats because they both had heavy oxidation. The heavier the oxidation is the heavier grit you should start sanding with but you should not need to go lower than 400 for cleaning. My Tiger had really light oxidation so I just used the color restorer with the buffer and it looks pretty good not amazing but good. I have read a few post on the The Beachcats website about a product called Poliglow its pretty tempting but I have not used Poliglow but it sounds better than wet sanding for 2 or 3 days! Make sure you do not apply much pressure when sanding or buffing you are just trying to remove the dull layer of gelcoat be careful not to sand too deep. ~ by Floyd on December 14, 2011. Floyd, those two cats look great! I’ve got an old H14 that I’d like to put a shine on. The decks are blue and I have oxidation and/or old wax in the anti-skid pattern. Do you have any suggestions for restoring color to the anti-skid? That’s a tough one I would use the barkeepers friend and a scrub brush on the anti-skid. Next I would try the 3M heavy cutting compound on a buffer using one of the bumpy looking sponge pads also made by 3M. Probably take allot of elbow grease if you think the decks have wax you can try some acetone to remove it. The non skid doesn’t really shine so I wouldnt work myself to death on it. Good Luck!